A great way to improve fitness, coordination, discipline and confidence in a safe and relaxed environment. As we do not take part in competitions but concentrate more on self improvement, kids do not have to 'fight' against other children. Its much more beneficial to instil confidence and respect in both themselves and others. This is a skill which will be much more useful throughout life than how to physically 'beat up' someone else. We usually accept children from 7-8 years and older, but this is subjective and dependant on the child. 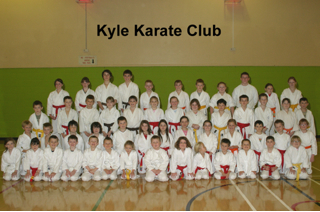 Kyle Karate Club is committed to creating a safe environment for children and young people and adults. We recognise our moral and legal obligations to protect children and will ensure that members will take all reasonable steps to promote safe practice and to protect children from harm, abuse, and exploitation. 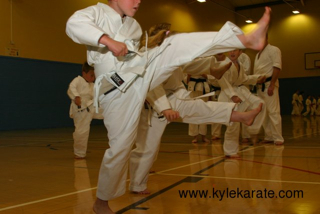 As a result of our commitment to the security and safety of the children who practice with us, all Kyle Karate instructors have completed and passed a Disclosure Scotland enhanced level assessment. The welfare of children is always the primary concern. All children have the right to be protected from abuse regardless of their age, culture, disability, gender, language, racial origin, socio-economic status, religious belief and/ or sexual identity. Protecting children and young people is everybody's responsibility. All children have a right to express their views on matters affecting them. Keep a register of every child involved with the group including relevant medical details and have a contact name and number close to hand in case of emergencies. Respect confidentiality and only share information/ concerns with the people who need to know in order to protect the child. Recruit, train and supervise those who work (paid and unpaid) using the Procedure for Safe Recruitment. Take all concerns/ allegations seriously and respond appropriately in line with these and South Ayrshire Council's Child Protection Procedures. We will refer not investigate. Encourage parents to become involved in the organisation and, when requested, provide them with copies of all guidelines and procedures. 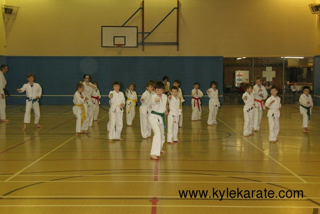 When there is a change in legislation or guidance on the protection of children or changes within Kyle Karate Club. Following any issues or concerns raised about the protection of children in this organisation.